In the future, the stick on nails you owned as a teenager will have new value, activating data bits that make diamonds and baby turtles rain from many screens all around, finally exploding in a messy gigabyte beauty bomb – a future that has already gone live amongst young, rich Chinese. Founded in Shanghai in 2012, Transmedia company Metaverse Makeovers are making apps and immersive experiences to turn virtual reality into a form of cosmetics. They give you fake nails, business as usual. Then they give you an app which allows the camera in your phone to translate the patterns in the nails into shooting stones, stars, lightning and other animated excitements. Through the internet you can trade these images with friends miles away, like a pixelated exchange traded fund or video game. Technology, meet cosmetics. Dazed spoke to Thea Baumann from Metaverse Makeovers about her inspiration, the invention of the app-cessory, and vision for the future. Dazed Digital: Can you describe the process by which the app activates the images? 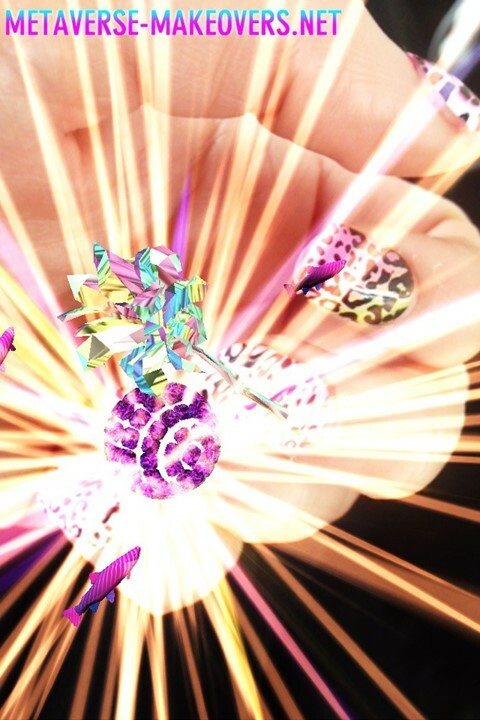 Thea Baumann: The camera phone sees the physical nail art to trigger a 3D animation which can be shared to social network streams like twitter and facebook. It is a combination of app development, 3D games design and augmented reality. DD: What was appealing to you about combining app design, mobile technology & cosmetics? Thea Baumann: I had been living in Asia for about 5-6 years, and I found nail bars to be some of the most interesting spaces as they are so technological. These women are very 'tech-ed up' and 'socially networked'. So what I was interested in doing was inventing new types of products that amplify or augment existing social spaces. Using new technologies to design products that connect these women with a social network online. DD: What is it like to work in China? Thea Baumann: I am fascinated by the post 90s Chinese internet generation. For me – as a developer of futuristic technologies – it’s a place where you can develop all kinds of products using their industrial manufacturing landscape, but where there is also this new market to speak to and develop for. As someone practicing new technologies, it's critical to actively engage in that region and to develop for these emerging voices. DD: How will people find your product? Thea Baumann: The nails will be available for sale as a physical product in nail salons. Then the app itself will be available for free to download via the App Store or Google Play. I will also be opening an online shop and they will be available through online marketplaces like TaoBao. Thea Baumann: It’s like buying stick on nails – you buy the nails and download a freemium app, but you also collect the different types of designs you want to pop from the surface of the nails. Its a virtual collector space – purchasing different types of holograms. DD: And what is going happen in the future? Thea Baumann: Metaverse Nails is being toured internationally as immersive experiences and will be available commercially in 2014. It is our first product and we will continue to work in the appcessories space making wearable fashion with 3D apps.